Kalwaria Zebrzydowska is an exceptional cultural monument in which the natural landscape was used as the setting for a symbolic representation in the form of chapels and avenues of the events of the Passion of Christ. The result is a cultural landscape of great beauty and spiritual quality in which natural and man-made elements combine in a harmonious manner. The Counter-Reformation in the late 16th century led to a flowering in the creation of Calvaries in Europe. Kalwaria Zebrzydowska is an outstanding example of this type of large-scale landscape design, which incorporates natural beauty with spiritual objectives and the principles of Baroque park design. The official name of this site is Kalwaria Zebrzydowska: the Mannerist Architectural and Park Landscape Complex and Pilgrimage Park. I think that just might be the longest name of any World Heritage site on Earth. That aside is one of the more questionable world heritage sites I’ve visited. I don’t really think that the architecture is that much different than you will see in hundreds of other churches around Europe. I’m also not sure that a glorified station of the cross is really worth of world heritage status. 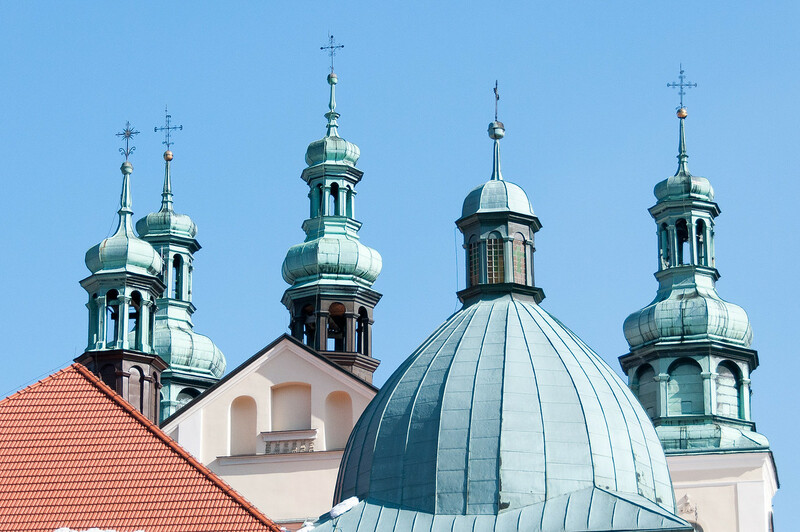 Nonetheless, this is a popular pilgrimage site for Polish people and there is quite a bit both inside and outside the main cathedral devoted to the visits of Pope John Paul II, both as a boy, a bishop, and pope. You can see a statue of him in the photo above. I went in early March, but I got the strong impression that the site is much busier in the summer. There were very few people there when I visited, yet there parking spaces for large coach buses, a restaurant, and a large bookstore. Almost nothing here was in English, which indicates that the site is primarily of interest to Poles. Kalwaria Zebrzydowska is a landscaped park and pilgrimage site that was inscribed as a cultural UNESCO World Heritage Site in Poland. It was inscribed in 1999 as a cultural landscape and religious structure. The layout for this pilgrimage park was designed by Feliks Zebrowski during the early 17th century. The landscape of this pilgrimage park in Kalwaria Zebrzydowska was meant to represent Jerusalem during the time of Christ. It is also recognized by UNESCO as it is a good example of a Calvary. This is a man-made landscape that symbolizes the various stages that led to Christ’s crucifixion. Many of these were built in Europe in the 17th century. The Kalwaria Zebrzydowska architectural complex and pilgrimage park consist of 44 buildings within its protected area. 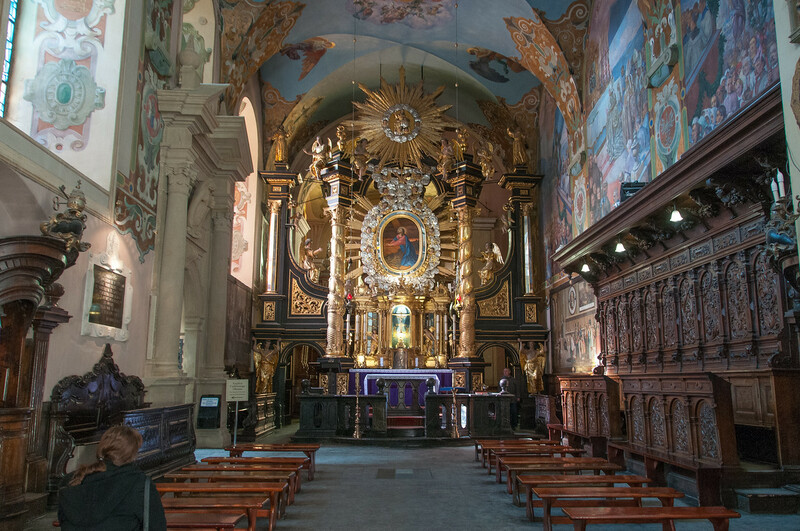 It was built in the 17th century soon after the Counter-Reformation during the late 16th century paved the way for the creation of Calvaries in the Catholic parts of Europe. The town itself is located in the town of Kalwaria Zebrzydowska; hence, the name of the park. Aside from being recognized as a UNESCO World Heritage Site, the pilgrimage park is also a National Historic Monument in Poland (added in 2000). Basilica of St. Mary: This basilica was established for the Order of the Friars Minor. The design of the church is a work of Giovanni Maria Bernardoni following the model of a 1584 map of Jerusalem. Ecce Homo Chapel: This chapel was built along with a plan for a Greek cross during the early 17th century. The vault is the most notable feature in this chapel. It is adorned with profuse stucco decorations. It follows the style of the Dutch mannerism design. Chapel of the Crucifixion: This chapel is not only part of the Kalwaria Zebrzydowska pilgrimage site but also known as the first structure that Mikolaj Zebrzydowski built in Kilwaria. It was the first structure to be built as part of the complex of landscape in the town of Kalwaria Zebrzydowska. The construction for this chapel was during the first few years of the 17th century. Heart of Mary Chapel: This chapel was built as modeled on a heart. It was a creation of Paul Baudarth in 1615. This chapel aims to commemorate Jesus’ encounter with Mary on his way to the Calvary.